It seems that the biggest mixed martial arts promotion also known as UFC will increase its Japanese involvement this year with two new deals. 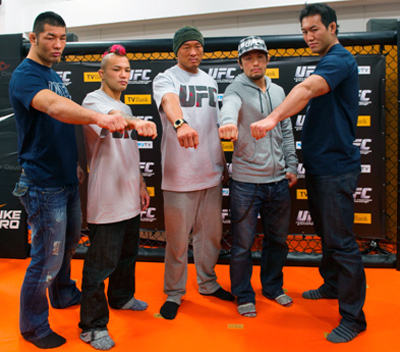 During a Monday presscon at UFC fighter Yoshihiro Akiyama’s Cloud Dojo in Tokyo, UFC announced deals with TV Bank Corp and Hikari TV. TV bank Corp. This puts the organization’s first official mobile site on all three major Japanes cellular network while Hikari TV streans live and archived UFC bouts. The ventures will be launched on Feb. 1. The TV Bank Corp. deal makes the UFC mobile site on NTT Docomo, namely KDD AU and Softbank, the top cellular carriers in Japan. UFC updates, ringtones, wallpapers, fights on demand and other contents are downloadable on these sites. Some contents can be downloaded for free while others are paid. Meanwhile, the deal with Hikari TV, run by NTT Plala Corp, opens the UFC to the company’s quickly growing subscriber list of 1.3 million people. In addition to live and archived UFC fights, the PRIDE library will be available. too. The organization will soon host a Japan show this year or the coming year.